The Market Opportunity Navigator is designed to help you master your market opportunity strategy and find out where to play. A market opportunity is a specific application of your firm’s abilities for a specific set of customers. To set a promising strategy, you need to understand which market opportunities exist for us, which of them are the most attractive and which to focus on. Use our worksheets to find the best answers, and visualize them, so that choice becomes more apparent. The set of potential market opportunities that you can address with your core resources and capabilities. These can be varied options, related to different types of applications for different types of customers. Market opportunities can vastly differ in their attractiveness. A varied set of market opportunities is an asset in and of itself, as it increases your chances of focusing on the most promising option. It also provides the basis for a Plan B, if required, and for un-locking new growth opportunities over time. ‘Look before you leap’ is therefore the first step for making a smart market choice. what other applications you can do with them for different types of customers. Because market opportunities can vastly differ in their attractiveness, you need to understand their characteristics. The Attractiveness Map allows you to visually depict the evaluation of your market opportunities, so you can better grasp their upsides and downsides, and compare them with each other. This visualization helps you in determining your most attractive options, at a given point in time, so that you can make an informed decision about your primary market opportunity– one that relies less on intuition or suffers from the biases that we all have. The attractiveness of each market opportunity is based on the potential it bears and on the challenge in pursuing it. The rating of each option on both dimensions results in its location on the map. A strategy that balances the tension between focus and flexibility, by consciously keeping open other market options: those that will enable you to mitigate risk and to increase value with minimum effort. After choosing your primary market opportunity, analyze which other options are suitable for backup or growth, based on their attractiveness and their relatedness to your primary market. This analysis can help you decide which options should be pursued in parallel, kept open for later stages, or put aside for now. The Market Opportunity Navigator not only gives you the ability to deliberately plan your strategy, but also to reflect and adjust it as you progress through your learning journey. To make this learning process broad and complete, we recommend that you use the Market Opportunity Navigator together with other key methods and business tools. Specifically, the Navigator is designed to work seamlessly with the Business Model and Value Proposition Canvases, created by Alexander Osterwalder and Yves Pigneur, and with the Lean Start-up methodology, created by Eric Ries and Steve Blank. 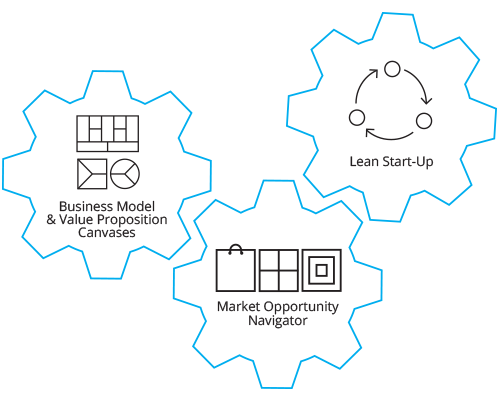 The Navigator – which provides the macro view of the landscape of opportunities – adds an essential level of analysis to the micro-planning of the Business Model and the Value Proposition Canvases, and helps you set your strategic boundaries properly, so that you can engage in meaningful lean cycles of experimentations. Together, these methods reinforce each other and create a powerful suite of tools. Use this powerful combination to set your strategy for success.